Is there something you want to know about aroniaberries, but were afraid to ask? Here’s your chance to ask Kenny (the aroniaberry expert) your questions about Superberries™ products and the aroniaberry, or browse below for answers to other commonly asked questions. When it comes to Superberries™, Kenny really is a know-it-all, without actually acting like a know-it-all. 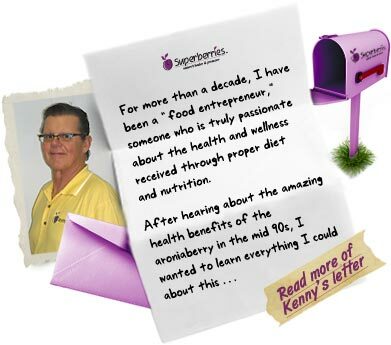 Email your questions to askkenny@superberries.com. Q: Do you offer any coupons or where can I find discounts? Yes, we do offer coupons or special promotions to all those berry believers who sign up for our newsletter or participate in our social outreach. If you would like to receive these savings and special offers, please click here. Scroll to the bottom of our homepage and enter your email address. Or also visit our sign-up page on Facebook. Q: What does your company sweeten the aronia berry juice with? The organic Aroniaberry Concentrate is simply the Aroniaberry that is squeezed into a juice; nothing is added. The sugar content that is noted on the nutritional panel of the concentrate is natural to the berry. As the Aroniaberries have a natural tart taste, if you would like to sweeten the concentrate, you can add it to lemonade, apple juice, orange juice, etc., Any beverage you like - including water. Q: With it being the cold/flu season, is it a good idea to take more than Aroniaberry chews a day? You certainly can eat more Aroniaberry Chews per day to help you get through the cold and flu season. The Aroniaberry Gummy Chews are delicious and are an easy way to get some of your antioxidants on a daily basis. Antioxidants are an important part of your diet as scientists have found that they can suppress or neutralize free radicals. Q: I noticed the last bottle of concentrate I used had a lot of chunks in the bottom, looked like crystals. Is this OK to use? Yes, absolutely. Becasue the concentrate is made by taking whole berries and squeezing them into a liquid, you may find some bottles with pieces of skin or pieces of berry that are visible and not completed compressed. This is normal and completely safe to consume. Q: Are the frozen berries just as beneficial as the juice? Yes, they are. The berries are taken directly from the vine, washed and then frozen. When using the frozen berries you are also receiving the powerful properties contained in the seed of the berries. The berries are also very easy to incorporate into your daily diet through side dishes, desserts, sauces and much more.